This was an easy, yet satisfying one - much like pizza in real life! There's several good tutorials online, but I liked this one the best. 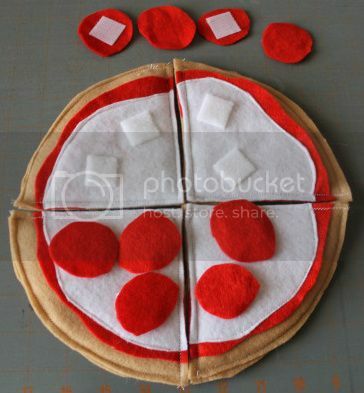 I used foam instead of stuffing, and it's perfect for pizza slices. 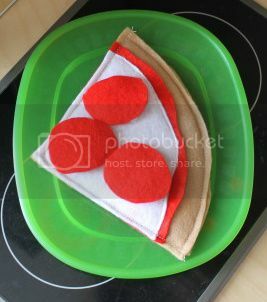 I put velcro on my cheese so that you could have your slice with or without pepperoni. Yes, I know felt sticks to felt, but "not well enough" says the Dude. I have got to get off the junk food kick. Next week, I'm forcing the pick of a fruit or veggie!